One of the coolest things about living in the country is the occasional wildlife that stops by. 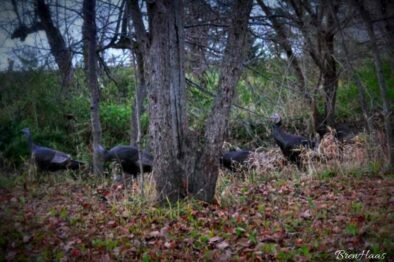 In this post, I share the wild turkeys and some fun facts about them in this Wild Turkey Sighting Post. How cool is that… turkeys decided to stop by the woods near our bonfire the other spring night. In this video see how new pup Oliver and Kink Kitty act. 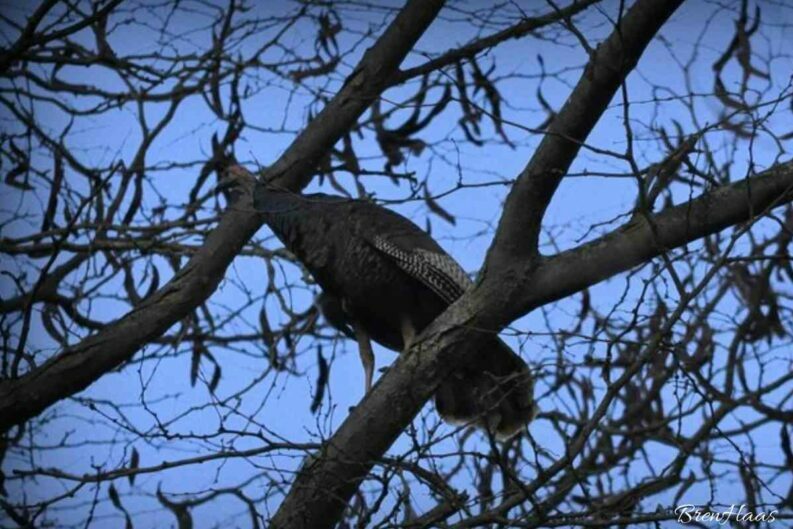 Here are some fun facts about wild turkeys in Ohio. 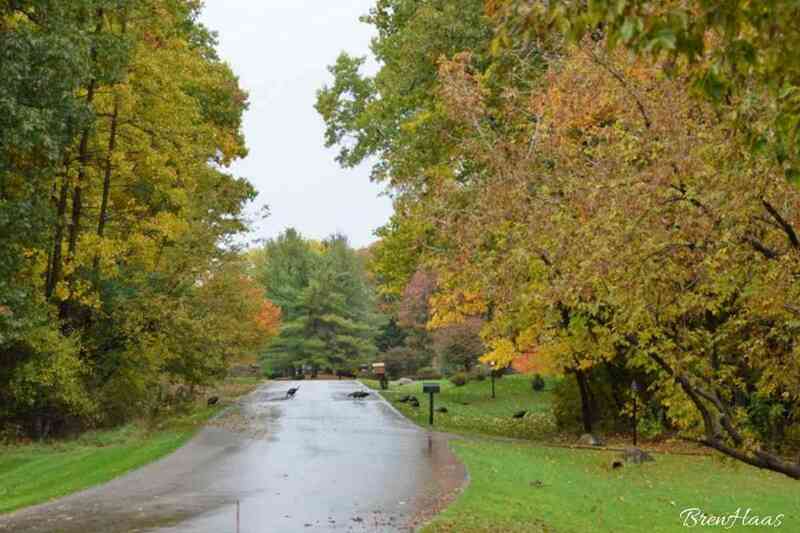 The wild turkey returned to the state after many years of absence. This bird once inhabited forested areas of the entire state, providing food and sport for Native Americans and early Ohio settlers. By 1904 there were no more wild turkeys in Ohio. 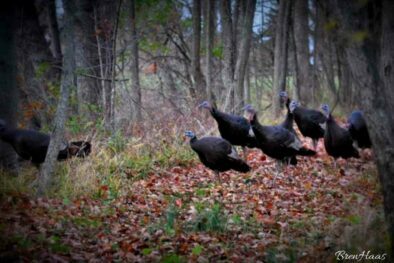 You can imagine what a treat it is to hear the turkeys in the woods around our home. 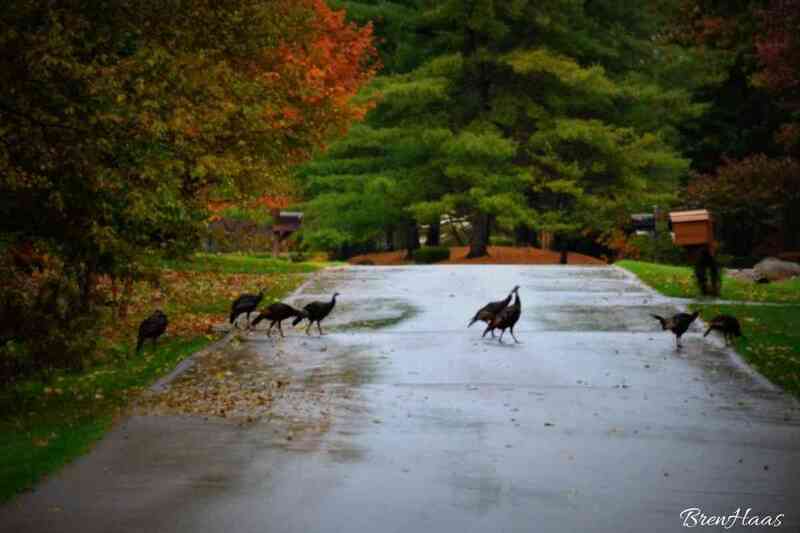 In 2014 a flock of wild turkey visited. It was the first time I ever spotted them so close and outdoors. Here are a few of the photos I took of that encounter. I want to note that it is super important to keep your distance from wildlife like the turkey. The wild turkey is Ohio’s largest upland game bird and can attack you! The critter stands three to four feet tall and weighing up to 24 pounds. Keep your distance! They will gobble and let you know to back off! At first, I thought it might be one of the eagles that nest close by but as I looked closer the bird was much ‘fatter’ and its head was small. As I got about 10 feet of the tree where these creatures were nesting I noticed there were 8 of them just above me…. they were turkeys. I had NEVER seen such a sight in my backyard. Just a few weeks before spotting the turkey in my backyard I had spotted a flock of turkeys walking across the street in a Brighton, Michigan subdivision. I couldn’t believe there was wild turkey walking in town. Just look at that landscape! They just keep on walking like no big deal…. I’d love to hear from you so be sure to comment on this post or my social media links provided. Want to keep it private just click over to my contact page. Isn’t it just thrilling to see nature up close and personal? How fun. We’ve got a lot of turkeys around here but I’ve never seen them quite that close other than in my car. I would’ve felt just a tiny bit uneasy too. That is a really cool link to the documentary Jaime – thank you for sharing this link. I will keep the ‘zoom lens’ in mind if I ever get to see those wild turkeys again. Happy Thanksgiving to yoU! I once went for a walk on the top of a mountain in Queensland early in the morning when a brush turkey appeared, gave me the evil eye and rushed towards me intent on attack. Luckily I was able to grab a fallen branch and bat it off as I backed to my car and rushed inside for safety. When I got back home, I told my husband what had happened and my husband fell around laughing saying “Who’s the real turkey, gobble, gobble!”. Now I’m really scared that I was so close to this group of wild turkeys. Could it be that Ohio turkeys are nice?! HA Either way, thank you for sharing your story and I will totally remember these events if I ever see them again.